Aqua Science Scale Prevention System features Filtersorb SP filter media to first remove the already existing scale from pipes and heat exchanger surfaces (descaling effect) and further to protect the system from future formation of scale (scale protection effect). Filtersorb SP is based on a completely different technology. In this process the chemical structure of scale forming minerals is changed. This technology is so effective that it requires a contact time of only seconds. The media is used in an up flow system, therefore only an in-out head is needed. The media transforms the dissolved calcium carbonate (temporary hardness) into non-charged, neutral chemical bonds. These bonds are completely stable and cannot attach to any surfaces. The chemical bonds are rinsed away by the water flow. The size of the bonds are so small (in the range of nano-meters) that they can only be seen with a microscope. Therefore the effect is the same as if the water was free of temporary hardness (calcium carbonate). The chemical structures are heat resistant and do not fall apart. Tests with commercial coffee machines showed that those with Filtersorb-SP Hardness Stabilizer protection were much cleaner after a short time of use than the control systems which were cleaned monthly. Filtersorb SP works great in front of RO membranes. It keeps these membranes from clogging with calcium-carbonate. A preexisting membrane’s efficiency is improved after only 10 days if calcium carbonate was the reason for the blocking. 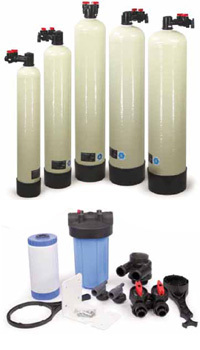 We are committed to providing the highest quality water filtration and well system supplies at the lowest prices. Copyright © 1985-2017 Aqua Science. All Rights Reserved. Products with *FREE SHIPPING only applies in the contiguous U.S.